Today, many academics and their disciples scoff at the efforts of Christian Apologists in the past who seemed desperate to prove the veracity of the Bible through archaelolgy, paleography, epigraphy, numismatics, or any piece of debris that the ancients threw into their trash piles. The discovery of the Dead Sea Scrolls was the source of great and enduring controversy for many reasons. One reason was that among those manuscripts were writings from the Hebrew Bible that basically demonstrated that the Hebrew Text we have received today had been faithfully copied from ancient times. That simple fact demolished the generations of unbelieving scholarship that sought to undermine the text of the Bible by questioning the reliability of its transmission from generation to generation. Irony plays into this, because there are many unbelieving scholars today who pin their hopes of undermining the Scriptures and the doctrine of God's Word on the discovery of some previously unknown manuscripts. These discovered manuscripts are held up as proof that the Bible is a dishonest representation of Christ and His teaching. The latest attempt at this was just published at the International Congress of Coptic Studies by Karen L. King in Rome last week. 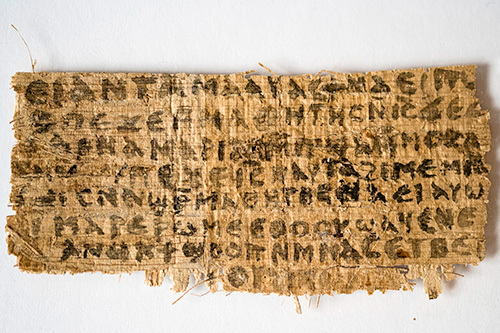 Her manuscript is a papyrus fragment about the size of a business card, acquired from an unnamed collector. It happened to be in a collection of manuscripts that this collector bought, and no one knows where the slip of papyrus came from. Well, according to newspapers like the New York Times: there you have it. A small scrap of paper which came from no-one knows-where and is a part of no-one-knows-what kind of document which unequivocally proves that Jesus was married and that he had a girl as one of his disciples! The NY Times wrote: "Even with many questions unsettled, the discovery could reignite the debate over whether Jesus was married, whether Mary Magdalene was his wife and whether he had a female disciple. These debates date to the early centuries of Christianity, scholars say. But they are relevant today, when global Christianity is roiling over the place of women in ministry and the boundaries of marriage." In that paragraph, the Times' author, Laura Goodstien, has told us why she chose to publish an article about this scrap in their paper. The issue of Gay marriage is at the forefront in this election cycle. The Roman Catholic church is currently being attacked because of its Scriptural and traditional stance against women in the priesthood. Many mainstream protestant and reformed denominations are changing their theology away from the Biblical teaching to adapt their teaching and practice against the Sixth Commandment in accordance with popular society. The discovery and publication of this scrap would appear to lend some academic credibility to these changes from the Bible's teaching. Revelation of the Unknowable God. Women and Goddess Traditions in Antiquity and Today (ed.). "Her particular theoretical interests are in discourses of normativity (orthodoxy and heresy), gender studies, and religion and violence." There is nothing in the scrap that calls the text a "Gospel." That was a term used by King to provoke interest and controversy. Perhaps the controversy around the "Gospel of Judas" may be the best illustration of what happens when such texts are discovered and published in sensational ways. National Geographic did a big production about how that manuscript undermined key teachings of Scripture and the Church. Then later analysis showed that the hoopla was all incorrect--that the so called "Gospel" of Judas didn't say anything that it was made out to say. So how should a Christian understand and react to discoveries like this? Consider the teaching in this prayer. And spread its truth in ev'ry place! O may Thy mercy never cease! O God, how sin's dread works abound! And keep us ever true to Thee. That we may seek no other guide. Sun Myung Moon passed away today. He was the founder of the Unification Church in 1954. The full name of his cult is "The Holy Spirit Association for the Unification of World Christianity". The Unification Church, commonly called "Moonism" in the United States, claims about 3 million members world-wide. Moon claimed that Jesus came to him in 1935 and told him to finish the work of establishing the kingdom of God on earth. Moon wrote his book The Divine Principle (published 1945) about his theology and plan to unite Christianity and the world into a one-world/one-religion peace movement. 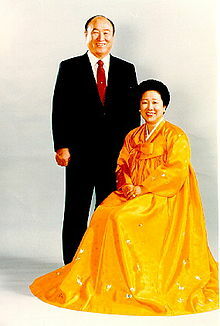 Moon claims to be the messiah of the Second Coming and his wife is the Holy Spirit. He and his wife, called The True Parents where he is the True Father and his wife the True Mother, are the first couple to be able to bring forth children with no original sin. "The cross is the symbol of the defeat of Christianity." The Bible is considered scripture along with Moon’s work "Divine Principles." Sin is genetically based. It is not a moral issue. The thieves on the cross represent political movements. The thief on the right side of Jesus represents democracy. The thief on the left of Jesus is communism. Adam and Eve fell because of sexual sin. Eve had sexual relations with Satan. Jesus is a ‘true person’ though not God in flesh. The Holy Spirit is ‘the True Mother,’ or ‘the Second Eve." The church denies the doctrine of the Trinity. Nature is dualistic: male and female, positive and negative, external and internal. God has an external and internal aspect called the Universal Prime Energy. It creates, develops, and sustains the cosmos. God's internal aspect of has to do with personhood - motivation, purpose and identity. Moon and his Unification Church have invested very heavily in quite diverse areas over the years. Just a few examples of media investments: Moon founded News World Communications in 1976 which purchased United Press International in 2000. In 1982 they founded the Washington Times. What this means is that the non-Christian cult of Moonism has great power and influence in the world through many investments. It remains to be seen how the organization will shake down now that the founder/messiah has died. Moon had instituted a political party in S. Korea called "The Party for God, Peace, Unification, and Home." This political group is now reported to be in charge of every polling station in S. Korea. It was Moon's intent to have this political group spread to Japan and the U.S.